Danielle Daws: Swaps, JAI Style! 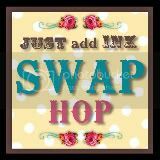 Welcome to the Just Add Ink Swap Hop! 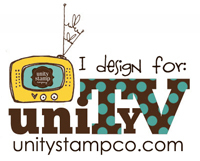 We recently had a card swap at Just Add Ink - a swap is where all participants make multiple copies of one card design and send them off to the rest of the group. 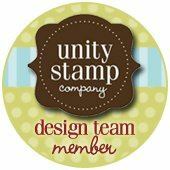 What you end up with is a copy of everyone's cards, but you've only had to design one! It's a great way to see different techniques and styles. Here's how our Swap Hop works... There are 14 stops on our Swap Hop (Just Add Ink and each of our 13 Design Team members), but the hop is set up in a loop so it doesn't matter where you start. All you need to do to follow along is click the Swap Hop button at the end of each post and you'll be taken to the next stop! The great part of that is that you can do the Swap Hop whenever you want. Here's the card I designed for our swap. It took me ages to come up with it - it's a bit stressful coming up with a design for awesome card makers!! The background is the small background stamp from Apple Blossoms, stamped repeatedly in Crumb Cake ink - about 12 times in total. I used my faithful Stamp-A-Ma-Jig (if you need a tutorial, check out mine on our previous Blog Hop... after you finish this one!!). Of course I had to add a bow!! And now you're off to see the DELECTABLE Amanda Reddicliffe! Oh Danielle this is soooo gorgeous. Danielle, it's GORGEOUS! Your fellow card-makers would have been thrilled to receive this beauty. Your work is fabulous. Absolutely stunning card Danielle! I really love it!!! Love the stamps you chose. This is a very elegant card, and I love the colours!! Fab! 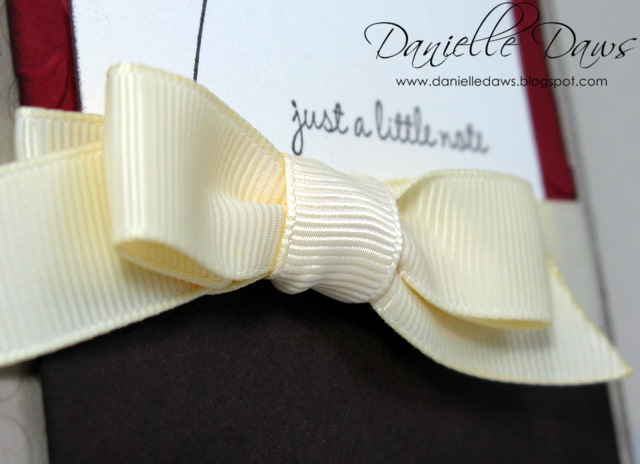 Danielle I loved receiving your card and especially one which has your famous 'perfect' bow! Your patience in creating all these cards is commendable, love your work! Love this Danielle! It's my favorite on the hop. Will def. be casing this one! Beautiful Card -- love it! 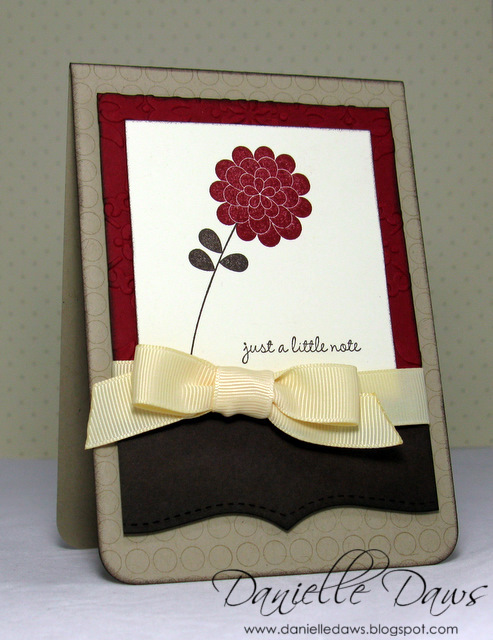 WOW another very patient background stamper! Love everything about ur card!! Hi Danielle, I loved your swap. It took Tania to work out what the background stamp was! That had me intrigued. I love the layout and the great colour combination. YUM!! The colours are divine, and I love how you've used that stamp set, Danielle. 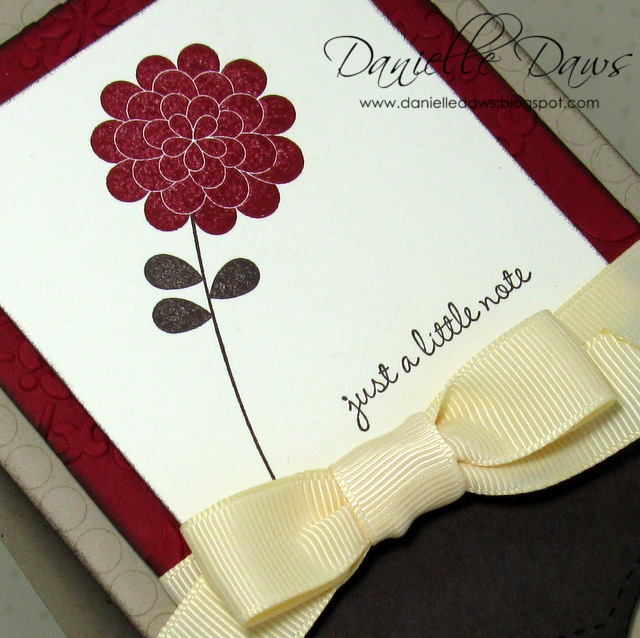 Gorgeous card, Danielle! I love all the colors and textures! I loved everything you did on this card and these colours are my fave too. Thanks so much for this beautiful, elegant card. Im thrilled to have it in my collection. Honestly I love this card Danielle! Its very classy and warm. You're not the only one who needs to acquire another lvl2 hostess set - lol! cause I love the effect you got with the spots on the background!! This is a gorgeous card Danielle. The colours are so rich and elegant. And the bow is just perfect, as always. I'm so glad to have a DD original in my collection! Gorgeous Danielle - one of my fave sets and the colours are delicious!